As part of Food For Thought’s efforts to teach children about where and how their food is grown, to learn about the benefits and joys of growing food and eating more fresh fruits and vegetables, we sponsor field trips each year to top-notch local farms. These field trips help children develop an understanding that food comes from someplace before it lands on the supermarket shelf. Farm field trips also help us raise awareness among the next generation of voters about preserving agricultural lands. Both Ventura and nearby Santa Barbara Counties are important historical centers for agriculture with significant tracts of ag lands. Yet, each year brings growing threats from development as the population of Southern California increases and property values rise. We seek to instill in our children a sense of place and pride in our agricultural resources as part of our efforts to help children appreciate where and how their food is grown. 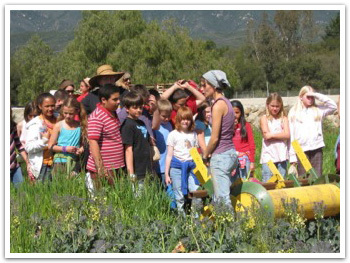 Children, teachers and parents have enjoyed field trips to McGrath Family Organic Farms in Oxnard, Fairview Gardens in Goleta, Churchill-Brenneis Orchard in Ojai, and Underwood Family Farms in Somis. 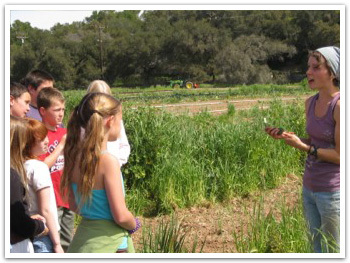 Starting In 2009, Food For Thought has been able to take all OUSD 4th graders to Rancho Del Pueblo Farm, right here in Ojai, at the Help of Ojai West Campus on Highway 150. This farm has been renovated and leased by farmer Steve Sprinkel (of The Farmer and the Cook) and his hardworking team. Environmental educator David White will introduce students to this stellar organic farm. All food grown at this farm is consumed in the Ojai Valley. Thanks to UC Hansen Trust, Kevin White’s “Rowing the Rainbow Bridge” fundraiser and ongoing Food for Thought Ojai fundraising we have been able provide these trips for over 2,000 students since 2003!